A glaring lack of security at UK prisons has been exposed, as inmates post pictures of illegal drugs, cash and weapons online. The Prison Officers Association (POA) said poor security oversight was a result of funding cuts. The images, attained by Channel 4 News, indicate prisoners have access to contraband, money, and drugs despite the fact they are incarcerated in supposedly secure jails. Evidence of drug-dealing was also uncovered, while one image depicted a prisoner in possession of a knife. An ex-inmate told Channel 4 that prisons are riddled with drugs. He added that prison officers and other staff members often smuggle illicit contraband into British jails. “Prisons are awash with drugs both legal (legal highs) and illegal. The main way that they come into prisons is through staff,” he said. In an official statement, the Ministry of Justice (MoJ) said it will never tolerate the use of illicit contraband and substance in UK jails. The MoJ stressed prisons deploy a selection of robust security policies to detect contraband, including body searches, metal detectors, x-ray machines, surveillance cameras, and body orifice scanners. It argued these measures also help to clamp down on mobile phone usage. But Peter McFarlin, chairman of the prison officers association (POA), said prison staffers simply don’t have the resources to carry out stringent security operations. “Since 2010, 7,500 frontline operational prison staff have left the service, 3,500 in one calendar year to 2014,” McFarlin said. “That means that targeted searching is not taking place, basic searching is not taking place, [and] intelligence-led operations are going to be impossible to perform within the prison as they were in the past,” he warned. Prisoners found to be carrying smart phones could see up to 24 months added to their sentence. Nevertheless, mobile phone usage is rife in UK jails. In 2013, 7,451 mobile phones were seized by prison staff. MoJ statistics also reveal drug use in prisons is common place. 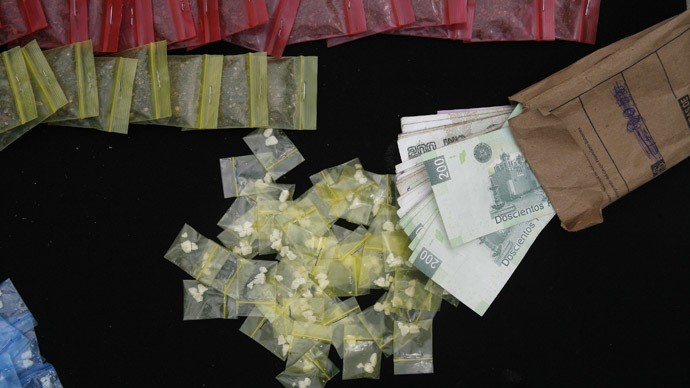 The latest figures indicate there were 4,500 drug seizures in 2013-14. Last year, critics attacked UK Justice Secretary Chris Grayling’s handling of the prison system. Chief Inspector Nick Hardwick said staff shortages and acute overcrowding in Britain’s prisons were so serious they are fueling a rise in suicides amongst UK inmates. Prison governors across the country have repeatedly warned that British jails are struggling to deal with increasingly crowded conditions, with a record prison population of over 85,000 in 2014. Budgets cuts of almost 25 percent over the past three years have compounded matters, according to senior prison governors. Professor Roger Matthews, a criminologist with a special focus on penal policies based at Kent University, warns Britain's penal system is characterized by deep structural problems. The only real route to effective reform of the prison system is to reimagine what the “role of the prison in 21st century Britain should be,” he told RT. “The government are currently tinkering around the edges of a fundamentally flawed system,” he said.